This twelve-week program is designed to train you to run/walk a 5K race or the 5K distance (3.1 miles of awesome!). The 5K is the most welcoming and accessible training cycle and race; the training program and race distance is perfect for those running for the first time or returning after some time off. As you train for your 5K, you will improve your cardiovascular fitness and overall strength with cross-training and other workouts that include hills (promise, they’re more fun than they sound!) and speedier sessions. PREREQS: Prior to starting this 12-week plan, you should be able complete a brisk walk or a run/walk combo for a continuous 15-20 minutes. In an ideal world, you’ve also been working out for 20 minutes a couple times a week for at least a month. But we know ideal doesn’t often happen, so if you don’t meet the exact qualifications, no biggie. You’ll still easily find your groove on this program. What’s more, this program is perfect for those of you who’ve never run before, are coming back to running from an injury, having a baby or other running hiatus. If you have been injured, please stay on top of any prescribed physical therapy, foam rolling and other rehab techniques so you can stay injury free. 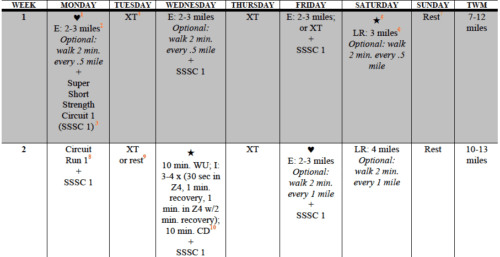 BIGGEST WEEK OF TRAINING: 12 miles + 30–60 minutes of strength/cross training. CROSS TRAINING + STRENGTH TRAINING INCLUDED? One weekly workout is your choice: cross training or a rest day. Plus, there are two weekly strength circuits that you can easily follow. Two routines include resistance bands. WEEKLY OVERVIEW: Four run/walks; one straight-up walk; one cross-training session or rest day; two strength circuits; one rest day. You’ll also receive exclusive Train Like a Mother podcasts, where we’ll answer all your individual training questions—and entertain you on your runs. As always, no question is too basic or TMI. We’ll also host exclusive pre-race webinars so you can chat with Coach Jenn to get all your individual questions answered. Accountability—and camaraderie—galore. In addition to Train Like a Mother Club, you’ll also be invited to join a private 5K Program club on Strava, where you can track your miles, and a private 5K Program Facebook page, where you’ll quickly find an army of (funny, empathetic, inspiring) #motherruner teammates. You’ll share training tips, stories of good runs and bad, cheer each other on, and push each other out the door. Momentum comes from teamwork, and these programs roll on some serious #motherrunner momentum. Expert, Accessible Guidance. We pop in via email weekly with a newsletter, as well as have a weekly Q+A with Coach Jenn on the Facebook page, gear giveaways galore, and discounts on training essentials. Sweet Discounts—and Giveaways—on Gear. Throughout the program, we’ll offer deep discounts on some of our favorite running things, as well as straight-up giveaways. If who’ve never run before, are coming back to running from an injury, having a baby or other running hiatus, this is a perfect, safe place to establish your workout routine and cross a 5k finish line! Prior to starting this 12-week plan, you should be able complete a brisk walk or a run/walk combo for a continuous 15-20 minutes. In an ideal world, you’ve also been working out for 20 minutes a couple times a week for at least a month. But we know ideal doesn’t often happen, so if you don’t meet the exact qualifications, no biggie. You’ll still easily find your groove on this program. No. The fee is for the comprehensive training plan, unlimited support, miles of resources, exclusive podcasts, and swag package, which will help you nail your 5K, both physically and mentally. At the end of the wave, you will participate in the organized 5K of your choice; you can also choose to run a 5K on your own, if that works better for you. Wait: So I have to pay for this program and a race entry fee? Within a few weeks of registration, every participant in a Train Like a Mother program receives a stocked swag package with some of our favorite training essentials. Domestic #motherrunners are charged $7.00 for shipping; international #motherrunners are charged $15 for shipping. If you order at a time other than registration, we need to charge shipping.